A while back, I had an opportunity to create a little local imagery utilizing HDR photography, of the Moorish style Plant Hall  on the University of Tampa campus in downtown Tampa, FL. I began photographing at dusk and continuing into the dark of night. It was a great opportunity to further my knowledge of, and to delve a little deeper into the world of HDR (high dynamic range) photography . HDR, which is thought by many to be a relatively new technique made available circa the age of digital photography, was pioneered as early as the 1850s by Gustave Le Gray to render seascapes showing both the sky and the sea. However, the ability to incorporate the HDR photography technique with digital capture cameras is a game-changer and has opened a whole new realm of possibilities. There are two main components to creating good HDR images. The first of is the capture of the scene in various controlled and differing exposures. The second is the editing of the images to combine them into a single image which will show the full tonal value of the image. It is a really amazing process which can yield an extremely wide range of results ranging from surrealistic fantasy images, to a more photo realistic style. 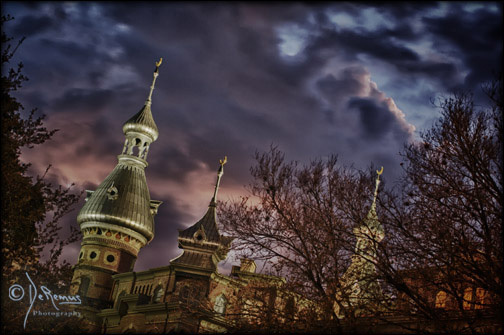 This first image of Plant Hall featuring its beautiful minarets was taken just as the sun had set and under a threatening sky. It had, in fact, just rained very briefly. On this image, I decided to keep it toned down and create more of a reality-based image. The photos I took to create this image were the last ones taken with any remaining ambient light left to work with. Using the HDR photography technique it is possible to step into a world of new dimensions to photograph with low light conditions. 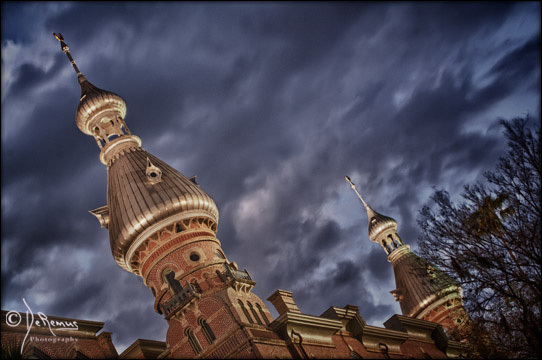 For these next series of images of the minarets taken at the the University of Tampa’s Plant Hall I was fortunate to have a greater presence of dark, moody storm clouds blow in. I processed this image using a little more of a fantasy look. 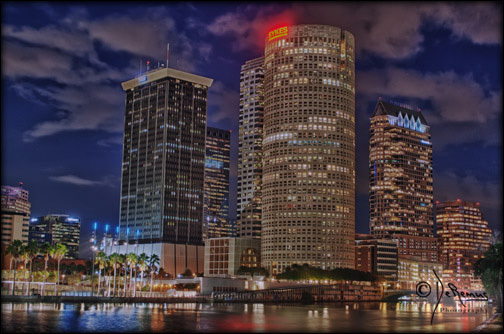 And this series of final images of the night, once again combining techniques for working with night-scapes and digital HDR photography capture and processing, was of a partial skyline of the downtown Tampa skyline with the Hillsborough River in the foreground. 1. 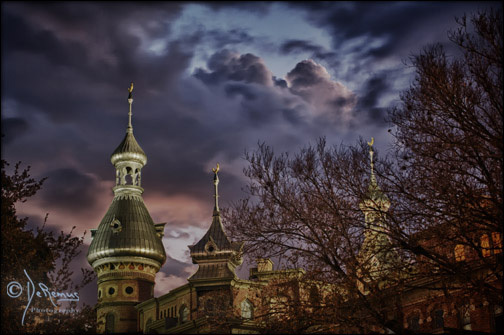 If you’ve been to the University of Tampa, you’ve most likely seen the minarets on top of the University of Tampa’s Plant Hall. The minarets have been variously described as being of Moorish, Turkish or Middle Eastern style. They sit atop a building that originally opened as the Tampa Bay Hotel in 1891. It became the centerpiece of the University of Tampa campus in 1933. Plant Hall – UT’s main building – is heavily steeped in Moorish influences, and serves as a leading example of Moorish Revival architecture in the southeastern United States. Plant Hall also serves as a focal point of downtown Tampa, and is a local landmark. The school’s newspaper is named The Minaret, a reference to the spires adorning Plant Hall. 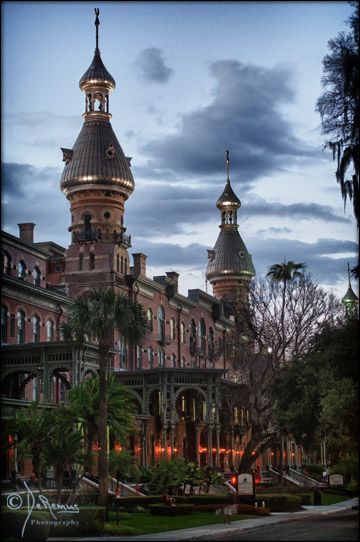 Formerly the old Tampa Bay Hotel, Plant Hall is a National Historic Landmark built in 1891 by Henry B. Plant. 2. According to WIKI: High dynamic range imaging In image processing, computer graphics, and photography, high dynamic range imaging (HDRI or just HDR) is a set of techniques that allow a greater dynamic range of luminance between the lightest and darkest areas of an image than current standard digital imaging techniques or photographic methods. This wide dynamic range allows HDR images to more accurately represent the range of intensity levels found in real scenes, ranging from direct sunlight to faint starlight. The two main sources of HDR imagery are computer renderings and merging of multiple photographs, the latter of which in turn are individually referred to as low dynamic range (LDR) or standard dynamic range (SDR) photographs. Tone mapping techniques, which reduce overall contrast to facilitate display of HDR images on devices with lower dynamic range, can be applied to produce images with preserved or exaggerated local contrast for artistic effect. In photography, dynamic range is measured in EV differences (known as stops) between the brightest and darkest parts of the image that show detail. An increase of one EV or one stop is a doubling of the amount of light. High-dynamic-range photographs are generally achieved by capturing multiple standard photographs, often using exposure bracketing, and then merging them into an HDR image. Digital photographs are often encoded in a camera’s raw image format, because 8 bit JPEG encoding doesn’t offer enough values to allow fine transitions (and also introduces undesirable effects due to the lossy compression). Any camera that allows manual over- or under-exposure of a photo can be used to create HDR images.